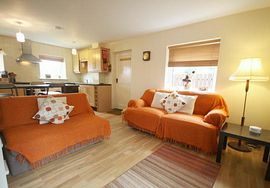 Sand Haven Cottage is a semi-detached house, sleeping 4 within the beautiful coastal town of Beadnell. In close proximity (4 minutes) of the best beach in Northumberland. This house is fully equipped to make your holiday relaxing and comfortable. Entering the house from behind the gates, you will firstly come across our outside patio area with garden furniture and Gas BBQ. This area gets the sun all day and is totally enclosed to ensure your pet stays safe. Windbreak, folding chairs, buckets and spades are all held in the cottage, to enjoy the beaches and rockpools. There is also a large grassed area at front of property, with seats to enjoy the sunshine. Downstairs: As you enter the house, you will firstly come to our Open Plan Kitchen-Lounge. 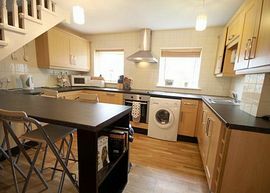 The Kitchen has a range of units including integrated fridge, freezer and dishwasher. There is also a washing machine, sink unit and breakfast bar. The Kitchen comes fully equipped with everything you need to make a full 4 course meal to a snack, or prepare for the essential barbecue. Our Lounge is equipped with Flat Screen TV, Freeview box, DVD-CD Player, and iPod docking station. 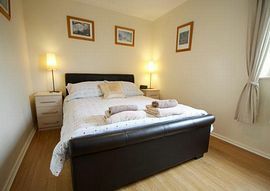 Comfortable sofas, of which 1 converts to a double bed. Our bookcase holds everything from books, CDs, DVDs, Games for your enjoyment. Electric fire and panel heaters provides additional warmth if needed. There are two bedrooms, 1 double and 1 bunk room, with adult sized bunks. A tourist information file is available in the Lounge with lots of ideas for days out. Well behaved dogs welcome. Parking available for two cars directly outside the property. 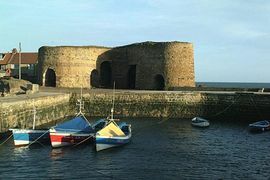 Ideal base to explore the Northumberland coastline. Quiet area to relax and enjoy your holiday. All duvets and linen provided free of charge. 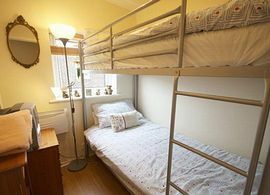 1 double room, 1 bunk room and an additional sofa bed in lounge. Well behaved dog welcome. Enclosed patio area to allow dog to roam safe and secure. Absolutely no smoking in cottage. Patio area with furniture and gas BBQ. 2 public houses and restaurants within 5 minutes walk of cottage. Local shop/takeaway. Seahouses is 2/3 minutes in car or a nice 15 minute stroll up the coast for a large supermarket, lots of public houses, restaurants and take-aways. By Car - Northumberland is sited just off the A1 motorway. Junction B1340 signposted Seahouses-Christon Bank. Full details on welcome letter. Full availability and latest prices and offers can be found on our website. Contact 07947 174459 between 3pm-8pm any day of the week.